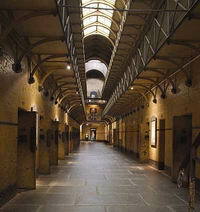 Find information concerning Old Melbourne Gaol in Australia. Check its location and main attractions. Highlight: City jail and gallows site where Australia's most famous criminal met his maker. Located near the Old Magistrates Court in downtown Melbourne, the Old Melbourne Gaol was used as a lock-up for prisoners awaiting trial, short-term petty criminals, debtors and condemned prisoners waiting for execution. There were 135 Hangings performed in its day (1842 to 1929), and today one of its main attractions is a permanent exhibit entitled "The Art of Hanging". Ned Kelly was Old Melbourne's most illustrious hangee, he is the notorious, armor-clad "bushranger", executed in 1880 and reincarnated 90 years later as Mick Jagger in the movie Ned Kelly. There are candlelit tours featuring theatrical interpretations about some of the colorful inmates performed Wednesday and Sunday evenings.